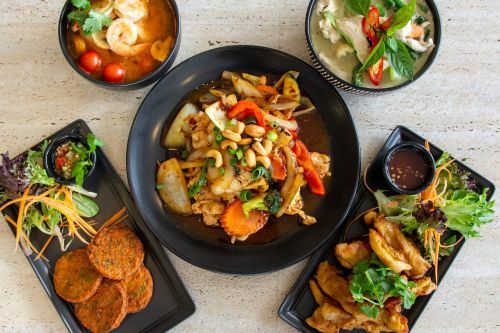 Menulog delivers for Thai La-Ong - Werrington County so you'll be able to track your courier on a map. Fried minced fish and herbs paddy served with cucumber, peanuts and coriander in sweet chilli sauce. Chicken skewers marinated in turmeric, curry powder and herbs, served with peanut sauce. Deep fried battered chicken wings marinated in turmeric, curry powder and herbs, served with sweet chilli sauce. Deep fried mince chicken, potato, carrot and peas with desecrated coconut and curry powder in puff pastry, served with sweet chilli sauce. Deep fried minced chicken, pork, crab, potato, carrot and water chestnut in crispy pastry, served with sweet chilli sauce. Deep fried tofu served with peanut and coriander in sweet chilli sauce. Deep fried battered squid, served with sweet chilli sauce and peanut sauce. Satay chicken, spring rolls, curry puff and money bag. Prawns, mushroom, herbs in spicy and sour soup. Seafood, mushroom, herbs in spicy and sour soup. Chicken and mushroom, herbs in spicy and sour soup. Mushrooms , herbs in spicy and sour soup. Chicken, mushroom, herbs in coconut milk soup. Minced chicken or prawns cooked with red onions, herbs and vermicelli in spicy lime dressing. Steamed vegetables tossed together with herbs and spicy lime dressing. Cooked and tossed together with cucumber, tomato, red onions, herbs in spicy lime dressing. Grilled sliced beef tossed together with cucumber, tomato, red onions, herbs in spicy lime dressing. Minced chicken cooked with lime juice, red onions, crushed dried chilli, parched rice and herbs. Masaman curry paste in coconut cream with potatoes, onions and cherry tomatoes. Yellow curry paste in coconut cream with potatoes, onions and cherry tomatoes. Green curry paste and blended herbs with coconut cream and vegetables. Red curry paste and blended herbs with coconut cream and vegetables. Panang curry paste with coconut cream and vegetables. Spicy country style with herbs, rhizome, peppercorn and vegetables. Ginger, onion and vegetables in soybean paste sauce. Basil, bamboo shoot and vegetables in mash chilli sauce. Onion and vegetables in pepper garlic sauce, garnish with coriander. Onion, long chilli, basil and vegetables in pepper garlic sauce. Onion and vegetables in chilli jam sauce, topped with cashew nuts. Onion and vegetables chilli jam, turmeric and coconut cream, garnish with coriander. Vegetables in thin soy sauce, topped with peanut sauce. Onion, tomato, cucumber and assorted vegetables in sweet n' sour sauce, garnish with coriander. Assorted vegetables, kaffir lime-leaf and basil in chilli curry paste sauce. A dash of ginger with snow peas, mushroom and capsicum in coconut cream. Chu chee curry paste with chilli, basil and coconut cream, garnish with kaffir lime-leaf. Bed of steam greens topped with your choice of meat, capsicum and mushroom in hoisin sauce, garnish with coriander. Marinated thigh fillet strips, battered and deep fried, served with sweet chilli sauce. Marinated pork strips, battered and deep fried, served with sweet chilli sauce. Marinated thigh fillet strips, served with sweet chilli sauce. Marinated pork strips, served with sweet chilli sauce. Marinated sliced beef, garnished with parched rice, served with spicy n sour fish sauce. Marinated octopus, onion, capsicum, mushroom and shallot, grilled with a hint of long chilli and basil, topped with sweet chilli sauce, crushed peanuts and coriander. Egg, onion and assorted vegetables stir-fried with rice. Egg, onion, pineapple and assorted vegetables stir-fried with rice. Egg, onion, bean sprouts, carrot strips, chives and radish stir-fried with thin rice noodles in sweet n' sour tamarind sauce. Egg, onion and assorted vegetables stir-fried with rice, mash chilli and basil. Egg, and assorted vegetables stir-fried with flat rice noodles in sweet soy sauce. Egg, chilli, onion, basil and assorted vegetables stir-fried with flat rice noodles in chilli jam and sweet soy sauce. Egg, onion, bean sprouts and assorted vegetables stir-fried with hokkein noodles in sesame sauce. Egg, onion, bean sprouts and assorted vegetables stir-fried with oriental style noodles. Egg, onion, bean sprouts and assorted vegetables stir-fried with thin egg noodles in soy curry sauce. Egg, onion, bean sprouts and assorted vegetables stir-fried with vermicelli noodles. Thin rice noodles, bean sprouts and assorted vegetable in coconut milk tangy sour soup. Thin rice noodles, bean sprouts and assorted vegetables in a clear soup. Chicken wonton, thin egg noodles, bean sprouts and assorted vegetables in a clear soup. Thin rice noodles and assorted vegetables in spicy sour soup. Chocolate, strawberry and caramel toppings.